Magnetics Business & Technology is edited for technical professionals in industry and government who integrate magnetic technologies into their products and applications, and to technical and management professionals in the magnetics industry. MB&T accepts contributed material for short, concise treatment of one topic. 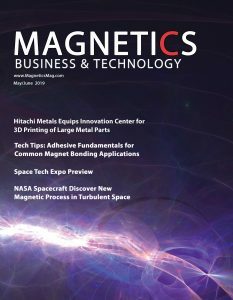 We publish feature articles that address solutions to the design, manufacture, distribution and testing of products and applications that utilize magnetic technologies; and of magnets, magnetic assemblies, magnetic materials and electromagnetic technologies. All articles must be submitted by e-mail. Articles should comprise of 2,000 to 2,500 words for a typical one to two page article, not to exceed 3,000 words. Articles may be edited for length, grammar, punctuation and style. Artwork is preferred with each article. Tables, charts and graphs should be prepared as neat as possible with data accompanying them in text-only format. Color graphics, screen shots or photos should be submitted as 300 dpi in .eps, .jpg, or .tif format, PC compatible, at approximately 3 inches. If you cannot provide artwork, let us know in advance so that we can make appropriate arrangements. Please submit a concise biography of the author with the manuscript, and include phone, e-mail and other contact information. Photo of author is encouraged. – Contact Scott Webster to propose an article.